We started our day with… da dah coffee LOL And then yummy raisin toast and butter. Having breakfast on holidays is fun. Then we both washed our hair and were off on the day’s adventure. 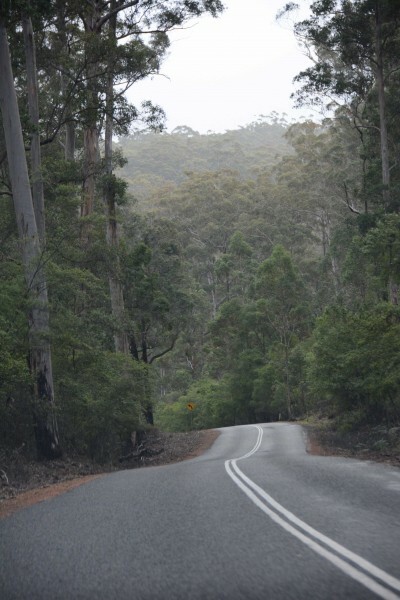 We headed north up the Vasse Highway (the highway near our cabin) towards Nannup. 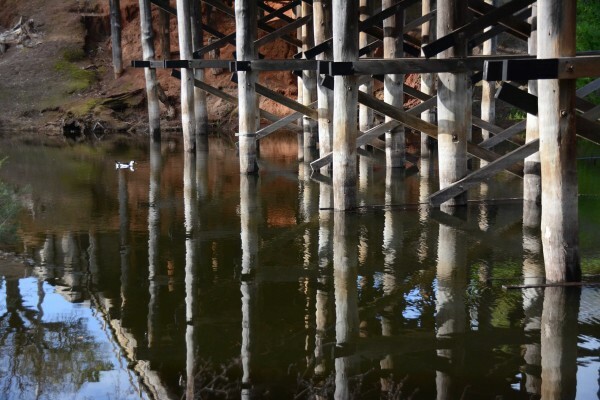 We’re always hearing about Nannup from people but had never been there. It was actually quite a long drive – definitely a bit further than we’d expected at 55.6 kms and 46 minutes according to GoogleMaps. We only passed a very few cars and one truck coming in the opposite direction, though there was a convoy of 3 caravans parked by the side of the road at one stage. We stopped to stretch our legs and take a couple of photos at Carlotta Brook. 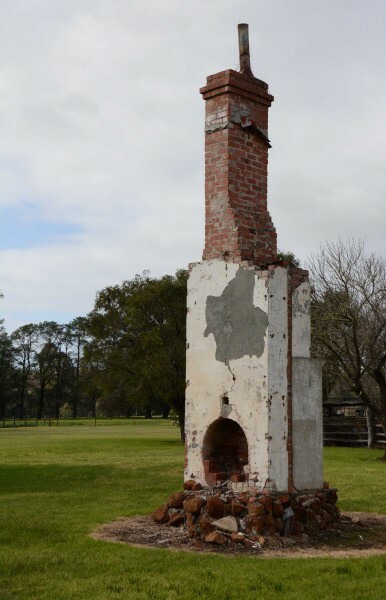 There was an old chimney, presumably all that was left of an old wooden house, in the middle of a field. 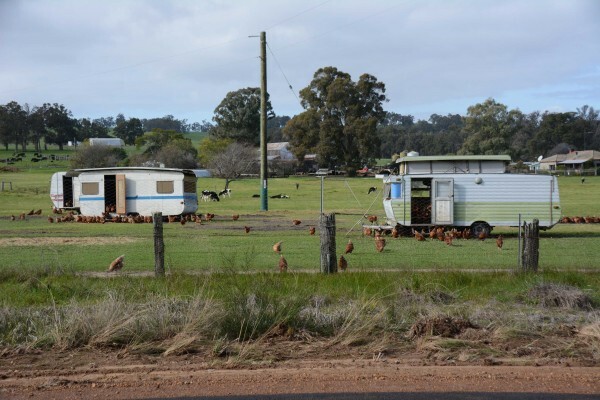 These are a fairly common sight in country Australia. We wondered about the history of the house and its family. We then crossed the road to look at the bridge. I looked along the top of it, but when I turned around, where was David? Not only was he down, underneath the bridge, but crossing the water via a pile of wooden pallets that someone had placed there, who knows how securely, or otherwise! 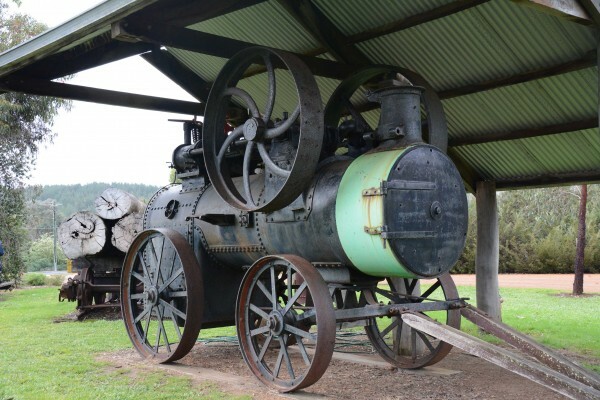 If you’ve read our Tasmanian holiday this will come as no surprise to you at all. Back to Monty and then before we knew it we were arriving in Nannup. On the outskirts of town was a timber mill. It was very solidly labelled as private property and we dared not go any closer, but they had the closest thing to a dalek that we’d so far seen. Darn it, why did the dalek have to be locked away, partially hidden from view? Oh well, some things are not meant to be. In the townsite itself was a Lions Park. Lions as in the club, not the animal, and there was an old engine, 3 massive trunks on a carriage, and a couple of labelled burls. We’d seen quite a few burls on the trees in the forests as we’d driven around. We didn’t stop, as this was a round trip and we’d barely begun. We headed on through town in a northwards direction, ignoring the left turn signposted as going to Busselton, and following our noses pretty much, but knowing that at some point there must be a road heading east that we could take. 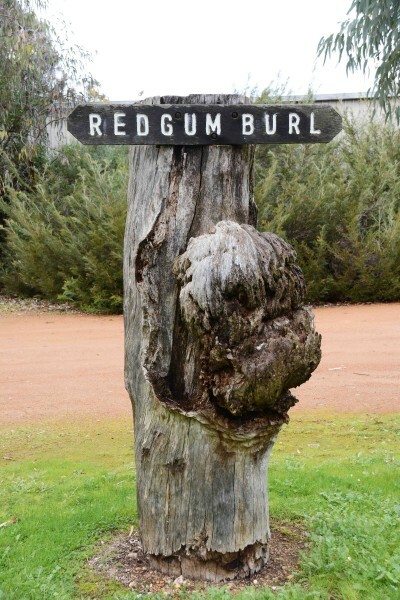 On the way down to Pemberton there had been nothing *but* signs pointing to Nannup! We passed one road to the right and David asked me to check the map in case we were going too far north. As he pulled to the side of the road while I looked, we found that we were in the grounds of an old, deserted school house. It was open for us to go in and look around, but badly vandalised with broken window glass all over the floors. There was the one school room, and a long ‘lean-to’ which looked as if it had perhaps been a kitchen. There was a structure outside with a back wall, 2 half side walls and a roof that looked rather like a giant bus shelter, and a little dunny that I was positive would be full of red backs. As we walked out of the school we noticed signs saying that there was probably asbestos on-site and any works should be approved by the authorities before being carried out. I wouldn’t have gone in there if I’d seen that first, but the notices were on the inside! All it said on the outside was ‘please shut the door firmly when you leave’, so we presume it was deemed safe to just walk around. 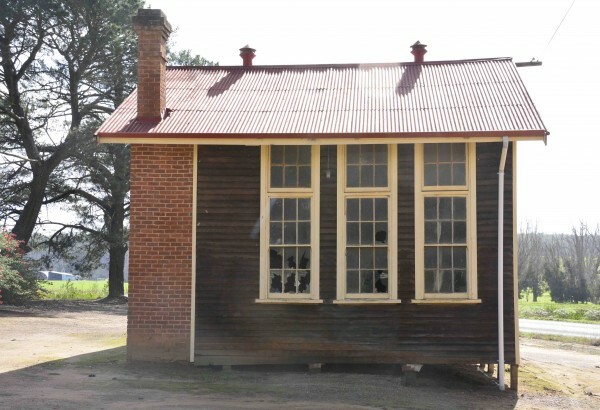 It was the Old Cundinup School, apparently rebuilt in 1922. I don’t really know what ‘rebuilt’ means – perhaps to the state that it is now run-down from. Poor little place. I decided that we would indeed backtrack the few metres to the side street, which headed for Kirup – a place famous during our teen years for its locally made grog. I’ve no idea what kind of alcohol it was supposed to be, but everyone who drank it seemed to end up totally legless on very small quantities of the stuff. It was nicknamed ‘Kirup Syrup’ and whether it is still produced I don’t know. So we were now driving along a typical country road, occasionally with fields, but more often with trees on either side. Its name was Cundinup South Rd . 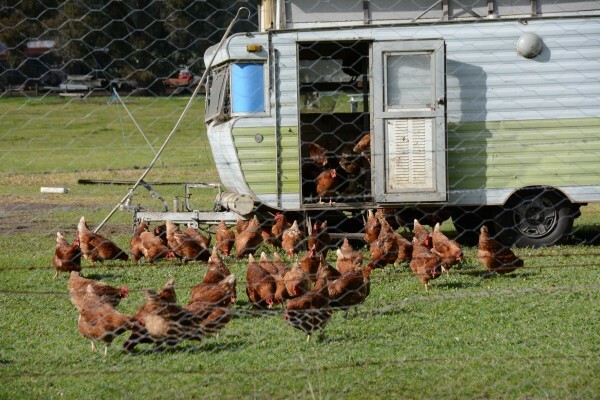 It was starting to get a bit boring when we could see a caravan in a field ahead. Then there was another caravan. And then we could see about 6 of them, dotted around, not at all in the position that they would be if it were a caravan park. We were a bit mystified and, as there had been nothing else of interest for quite a while, David began to slow so we could safely gawp. We finally saw what the caravans were about and laughed with glee! David stopped the car and we both got out with our cameras poised. How fantastic is that? I think it was just about the highlight of our holiday! And then back on the road, which went on for rather too long with nothing but some lunching road maintenance guys to exchange interested stares with along the way. This road is apparently 23 kms (28 minutes) long. At last we reached the end of this road and I got David to pull over before we turned right onto the South Western Highway – the road we’d travelled down on Monday. This was the closest we would get to the shop where I’d spilled David’s coffee and I felt it worth giving them a ring to see if they had his keys. But what was the name of the place? I got my phone out, stood outside the car, held it high, and I could occasionally get 1 bar of reception. Tried WhitePages directory and a few other options for ‘café’ ‘Lowden’ but could not come up with an answer because no page could complete loading. And then it started to rain with big, heavy spots. We were laughing and groaning, both about the lack of technology, and our reliance upon it. But in the end I gave up and we turned south once more. Kirup itself was a little to the north, but we didn’t really want to go there. Sorry Kirup. 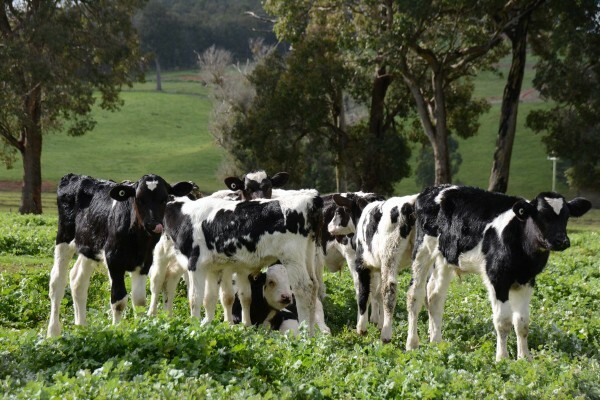 The first little town was Mullalyup, and this is where the Freesian calves had been. And they still were – so exciting! And I wasn’t the only moron out of my car photographing them, there was a man there too and we exchanged a few words about the beauty of cows, while David stayed in Monty. Some people have no taste! Just a few metres further on was the grassy island on the lake with the bare trees. I shouldn’t have bothered getting back in the car if I’d known how close it was. However, across the road was a garage and in the garage was a police car along with a vehicle he had obviously pulled over. I asked David to wait until the policeman was free and to please ask him if he knew the name of the café at Lowden. Police are there to help you aren’t they? David seemed unsure, but I gave him lots of encouragement, as a loving wife should 😀 And he did. The police officer knew it had recently changed hands, but was sorry that he didn’t know the name. It *had* been called Lowden Café. Well that was all I needed because I now had enough reception to actually find the number and give them a ring. No, they’d not found any keys. We were interested to see that once I’d dialled the number and was holding the phone up for David to also listen, and we were still stationary in the garage carpark that the police officer left. He’d been sitting in his car behind us until that point. *Had* he been making sure David wouldn’t drive and use his mobile phone at the same time? The next town was Balingup and I don’t know why it had appealed to me so much as we headed through it on Monday, but it did. We decided it was well and truly time for lunch, and chose the ‘Balingup Mushroom Café’, not least because there was a carpark next to it and it was on the left side of the road. David chose the cauliflower and bacon soup and I chose the veggie frittata with chips and salad. David was cruisin’ for a bruisin’ as they say. If I offer him cauliflower soup at home he pulls faces!!! The lady that took our order noticed my nails and was excited and fascinated, and we had a bit of a chat about it. I know she was excited because the lady who brought the food out to us said that she’d been told to ask if she could look too LOL The food was really very nice indeed, and most welcome, and we followed it with a coffee. Next, we’d noticed a signpost to ‘Old Cheese Factory Crafts’, which was down a side street and around a couple of corners. Wow! This place was a honeycomb of rooms, all joined together, each with a dizzying quantity of various crafts. However, there had been no toilet at the café and, although prepped, David didn’t ask the young fellow at the counter if they had one here. If it had been an older person, or female I’d have asked myself, but I wasn’t going to ask a young guy, and David got in a bit of trouble. We couldn’t see any toilets so we left before even looking at half of the place and went to find the public ones back in town. No brownie points for David this time. We didn’t go back to the ‘Old Cheese Factory Crafts’. Seemed a bit odd to disappear and then reappear so we continued on our way, and that didn’t totally thrill me to bits either. Some women are hard to please! The next town was Bridgetown. A *much* larger place and famous for almost always having the lowest overnight temperature in the whole of WA, and frequently the lowest maximum too. But it was a nice town with a nice feel to it. We went into the IGA supermarket to get a few things for meals and wandered along the street. There was a lolly shop and I had a sudden thought. David’s Mum had said to us jokingly “Bring me back a stick of rock!” when we saw her last, and I had a feeling this shop would have some. It did. And we bought a stick each for the grandchildren, some liquorice allsorts for David’s Dad and some fudge for me. It was deeeelishus! Further along the street was the Pottery Café and we thought we’d try this for a coffee. But no, it was shut again. The sign outside said that the owners are grandparents and sometimes there were children to care for, or they were just plain tired so, if the sign was up on the pavement they were open, and if it wasn’t then they weren’t. They weren’t. So we went back to Monty and continued our way south. Not by far as it happens. Once we crossed the bridge, that we presume the town was named after, there was a grassed area and views under the bridge so we decided to go down there and check it out. 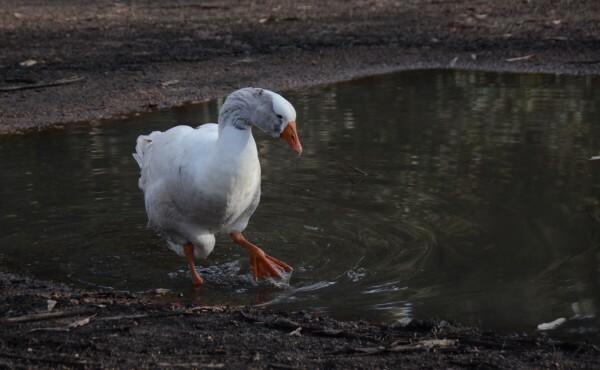 It was really picturesque and beautiful and there were 2 white geese who seemed in charge of the place. It was lovely to take a few photos of the water, the bridge and whatever else caught our eye. Once on our way again David announced that Monty had come up with a red light. He was describing the shape and colour of it to me and I looked it up in the manual. ‘Low coolant, fill up very, very soon’ was pretty much what the book said. I suggested we turn back; we weren’t far out of Bridgetown, but David wanted to continue. 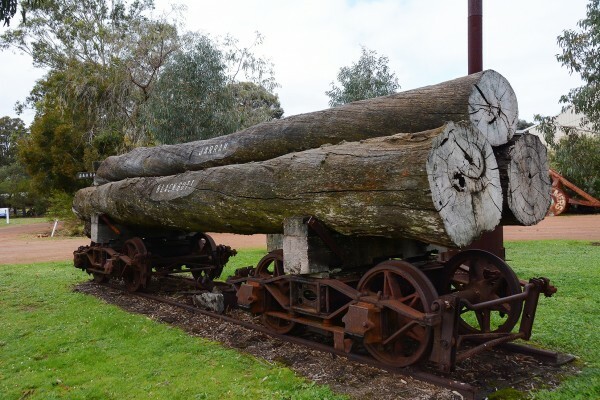 I was on the edge of my seat for the whole time, but after a while we arrived at Manjimup. David pulled into the first garage and bought a huge bottle of the stuff that cars take these days instead of simple tap water, and poured it in. I felt as relieved as Monty was, and David kept a sharp eye on the dash in the coming days. But all remained well thankfully. 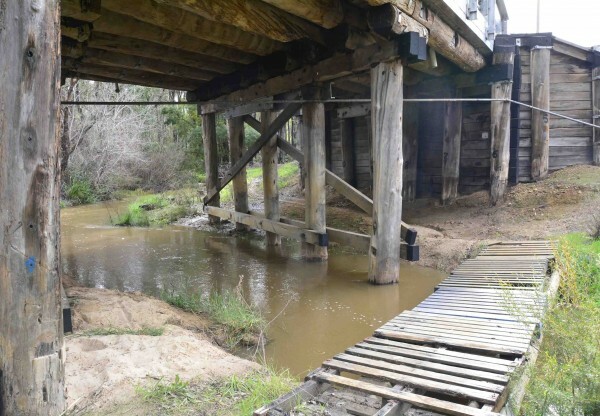 So relieved to have solved that problem it never really crossed our minds to look around Manjimup. Unusually, Manjimup town/shops were off the main road and you had to take the big, flowered roundabout to get to them. But we didn’t. We just headed straight on through and took the right turn into dear old Channybearup Road. 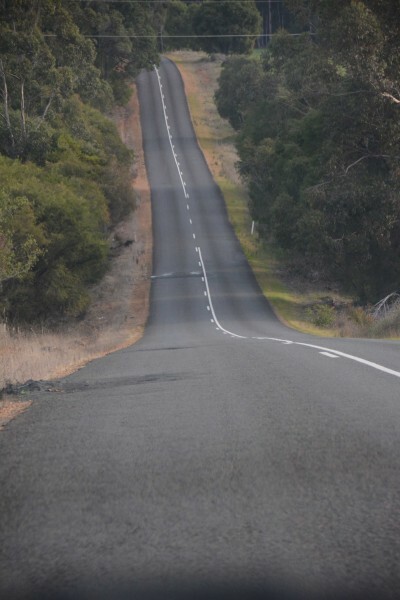 Channybearup is about as hilly a road as anyone could wish for. Bearing in mind that hills never show in photos, you can perhaps imagine what this is like in real life. As we passed one of many avocado orchards, David suddenly noticed that there was a little unmanned stall by the side of the road. He chucked an awkward Uey – the visibility wasn’t that good for oncoming cars – and we went back. Absolutely massive avocadoes were there for sale for only $1 each! The sorry little specimens that we get in Perth have been closer to $3 or $4 for months on end, if not, the entire year! We were then home with the fire alight and settled in with a coffee by 5pm. There had been no rain today so there were no crystal sparkles on the trees.